In this article, I continue to explore the spirit of our times and what popular culture might be revealing about the emergence of a new guiding myth for the task before humanity. I continue to assess the media landscape for hints that we might be shifting from deconstructing previously important mythic signposts to raising new ones. While any hard and fast answers still evade me, several recent works have caught my attention and seem to illuminate a larger trend that speaks to our increasingly urgent condition. 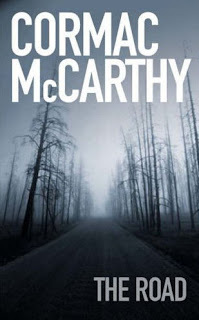 The brilliantly written novel by Cormac McCarthy,The Road (for which he won a Pulitzer Prize in 2005), follows the journey of a father and son struggling to survive and maintain hope in an inescapably bleak post-apocalyptic world. The novel is set in a not-too-distant and all-too-possible future landscape of environmental devastation and human barbarism. As I read, I found myself identifying with the young son who says simply "I'm scared" as they approached situation after situation with little chance of redemption. Like the boy totally dependent on his father, the reader is put in the role of trusting that the author has something important to show us against the backdrop of sustained tension and dread. The father works to protect the boy's faith that there is a core of ethics left somewhere in humanity - an assertion that looks increasingly unlikely as the novel unfolds. This feeling is echoed in a recent adaptation of another McCarthy novel, the film No Country for Old Men. Like The Road, we find ourselves in a brooding, harsh landscape; this time the southern U.S. border of 1980. The film explores the inherent imprisonment of a determined world, where a coin toss can determine if one lives or dies, and the frailty of our biological existence hits home like the thunk of a killer's cattle gun - as effective on humans as on any other animal primed for slaughter. 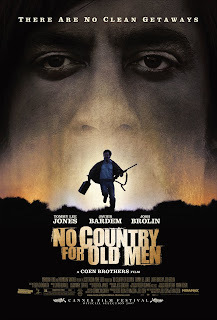 The Village Voice describes the characters of No Country for Old Men as "members of some endangered species trying to forestall their extinction." Though it's not always easy to watch, but there is something beneath the surface that elevates this film beyond a traditional shoot 'em up or just another depressing art house meditation on human fallibility. Its redeeming element is its unusually masterful crafting. An astonishing job by the Coen brothers (who won an Oscar for their directing) made me look harder at the feelings this film invoked in me. What does its message (and popular success) reveal about our contemporary self-concept and the hopes and fears of where we may be headed? I might have attributed whatever broader meaning these works revealed to novelist Cormac McCarthy alone, if, around the same time, I hadn't seen the film There Will be Blood. Like No Country for Old Men, it was nominated for 8 Oscars, winning Best Actor for Daniel Day Lewis' mesmerizing leading role. Set in the oil fields of the early twentieth century, There Will Be Blood, The Road and No Country for Old Men share a similarly unsentimental, near perfect artistic crafting that is hard to call anything other than beautiful. A sense of impending doom fills all three works. 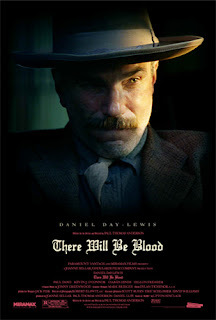 It stalks each frame and page, whether personified as an unstoppable bounty hunter, the relentlessly off-kilter and haunting score of There Will Be Blood (composed by Radiohead's Guitarist, Johnny Greenwood) or the ash falling with haunting regularity throughout The Road, fall-out from some never-explained man-made catastrophe. All three are soaked in a pitiless quality that captures the audience with a sense that "truth will be spoken here." We trust that we are going to receive something accurate even as we increasingly realize that it's not going to be a happy or even a clear outcome. We trust that there must be something important to see here, where the vultures swarm and where man goes horribly astray. There is a shred of unsentimental hope in each work: the soot-covered purity of The Road's boy; There Will Be Blood's deaf, adopted son's escape from his father's mad clutches; and the aging country sheriff of No Country for Old Men who dreams of his own father carrying fire in a horn, "going on ahead, and fixin' to make a fire" in the surrounding dark and cold. These three works felt to me like articulations of a larger realization happening within great swaths of our culture; like "Dead End" signs appearing along the road that we collectively race down. Things are bleak. Can anything be as depressing as knowing that you're headed for a brick wall, but, lacking visible alternatives, continue driving anyway? As parables, they tell a story which news headlines and stark documentaries can only hint at. They tell me that there is something dark in the human character, of which the evils of the world are only symptoms. This darkness forms a hole in our lives and a sense of loss that is hard to address directly. Perhaps an unflinching mythic glimpse into our own darkest corners is an important first step? If we can just put our finger on the lingering dissatisfaction that pulls us toward self-destruction, we may be able to redirect our course. Giving image and name to our collective sense of doom might rob it of some of its power otherwise so subtle and pervasive as to seem inevitable. Visible, it can be seen, named, and rejected. And here, for me, is where author Brian McLaren came in. While thinking over this dark picture of our shared mythic landscape, I read a couple of books by this leading proponents of the "emergent Christianity" movement. In The Secret Message of Jesus, Brian McLaren offers as hopeful a picture of the heights that human beings might attain as The Road and There Will be Blood show of our darkest depths. 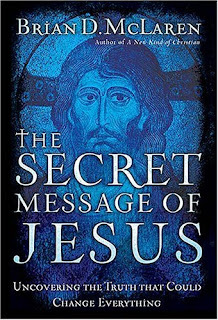 By no means alone in his re-examination of the life and teaching of Jesus (the Da Vinci Code phenomenon was just the tip of the iceberg), McLaren's technique is a decidedly integral one. Post-modern and pluralistic, it doesn't seek to create another doctrine or set of beliefs but rather brings self-awareness to the process of how doctrines are established and interrupted in the first place. Different from some of the other authors in this booming genre though, Brian McLaren's perspective is not that of a distanced researcher but of a true believer. A pastor of his own non-denominational church, McLaren is seeking to re-frame who we are and what our role in society might look like, while honoring the religious tradition he finds great value in. His explorations shed light on a new articulation of "the kingdom of God" - a kingdom that is of this world but based on very different virtues than the predominant ones around us. An interruption that is at once both generous and orthodox, the message he delivers is both radically different and yet familiar to what one would recognize at a traditional neighborhood Sunday service. In his books McLaren deconstructs the Christian church, offering a history of the institutionalizing of this mystical message. He moves beyond denouncing the exclusionary, self-serving tendencies of organized religion, responsible for countless intolerances and atrocities, to find these tendencies within himself. He articulates the impulses behind the differing traditions and denominations and how they correlate to important elements within his own understanding of what Jesus' full message might look like. What he discovers might be a beacon of renewal not just for the Christian religion but for the whole world. The message that he rediscovers for himself is as revolutionary today as at the time it was given, offering much more than just the foundation for the religion that followed. Heard again as if for the first time, this message offers an exciting present and future possibility of what could be; an unlikely secret that holds the power to divert us from the train wreck we seemed destined for. Perhaps a re-emergence of Jesus' original teaching, placed back into historical context and shown for the radical message it is, begins to articulate (or unearth) an alternative route running counter to our own personally engrained social, political, intellectual and spiritual beliefs. A message asking for as revolutionary a change to our daily lives as to those of any institution. The message of Christ hints at a way of being that can overcome the most inevitable forces of darkness within our own humanity. Radical forgiveness, service to the poor and sick, a slow and steady aligning of our will with God's ("Thy will be done on earth as it is in heaven") - stripped of the nauseating rhetoric and distorted lens that the Christian church has all too often applied - this message offers a revolutionary and unlikely promise. Just as the potential for growth of the tiny mustard seed is invisible to the physical eye, so the "kingdom of God" asks us not just to look again, but to transform the very way we see. Like Rudolf Steiner's Higher Worlds, this kingdom awaits those "with ears to hear." This unseen kingdom is present, not just despite our despair and bleakness but also because of it. Recognizing the truth of our current situation, and accepting our personal responsibility for it will necessitate a radical re-thinking (the original meaning of metanoia "to repent"). If enough of us glimpse such a kingdom and, in our glimpsing, re-think our lives, and in re-thinking our lives believe that the impossible is possible, things could change dramatically. And given the reports on the condition of the road ahead, let's hope that we choose to shift trajectories soon. three additional essays available. see links below or above title.